Looking to Buy an Online Business? Keep These Tips in Mind! As of January 2018, the number of internet users around the world has grown to a staggering 4 billion. With total ecommerce sales steadily on the rise and projected to reach a total of $4.51 trillion by 2021, having an internet business has become a very attractive prospect to entrepreneurs all around the world. But starting your own internet business isn’t as easy as it seems. Depending on your skills and experiences, you may choose to start from the ground up, or purchase an already established brand. If you have enough capital to buy an existing brand, it is worth a serious consideration as it will give you a significant leg up on others who are just starting out. What factors do you need to consider when buying an internet business? Look for a business that has been around for at least 12-18 months ideally. Businesses with this type of age should have a record of consistent profits and revenue streams, and should have evidence of consistent growth right up to the point of acquisition. Be sure to review the financials and traffic of the business to make sure that it’s right for you. Financials are provided by the seller and can be further vetted during due diligence, but to confirm traffic you can request Google Analytic access as well as utilize tools such as Semrush.com, Majestic.com or Ahrefs.com for keyword rankings and backlink profile information. If the business you are targeting isn’t established/under 12 months old, you don’t necessarily have to walk away from the sale. Since the business is young, you may be able to leverage its age to negotiate a better price. Just be sure that it has upward potential, and assets that will benefit you. Look for a business that will be easy not only to transition and transfer, but also a company that has certain people in place that enables the heavy lifting and grunt work to be outsourced. Having a reliable and loyal team in place who have a firm grasp on the day to day operations is extremely valuable and can save you from a ton of headaches versus having to handle everything by yourself. This allows you to focus on more important elements of your new venture with the confidence of knowing that everything else is being handled by your team. If you come across a business that isn’t fully passive, there are many resources that can be leveraged to slowly build a system that can turn into a passive type of company. Hiring virtual assistants who have expertise in certain aspects of your business that you either don’t have knowledge in or don’t want to focus on would be a great first start. This enables you to put your efforts on growth and moving the needle while your team of VAs can handle the more tedious tasks. Another significant consideration should be the business’ opportunities for expansion. You want to acquire a business that can adapt to new changes. Diversification of investments is essential when competition is tight. Will this business allow you to create new products or services that fit in with the existing products/services? Do they have existing customers ready to buy? Will developing new products let you successfully penetrate new markets? Will you be the first product to that market? Will the growth allow you to create a new market? Can the business grow without exerting too much effort? These are a few questions to consider before buying a business based on its growth potential. You cannot afford to be complacent, opportunities for growth should always at the front of your mind. The amount of traffic that the site or brand gets is something to take into serious consideration. Online traffic and marketing will be how you grow your reach, and how you can begin to grow your brand recognition. You will want to buy a business that generates consistent traffic across multiple channels, versus being overly reliant on just one source. If the business you are about to buy relies on only one traffic source, be prepared to find new ones. As long as traffic is consistent, you will have opportunities for growth. Email marketing is one of the top strategies when it comes to ROI. Acquiring a company that has an established and loyal email list of customers is a great bonus asset that could increase the value of a web business. A business with multiple income streams is a major plus. It’s important to not rely too heavily on one specific product or service. Multiple sources of income will give you more options to make the business profitable and increase growth potential. 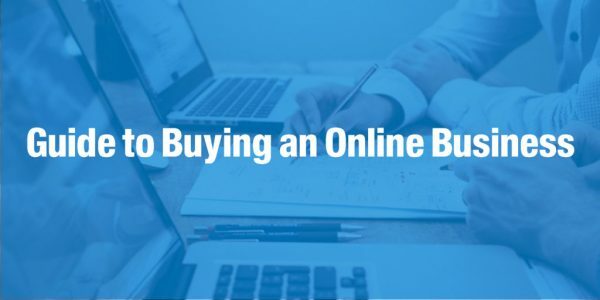 It is better to purchase a brand that earns revenue from ads, memberships, and product sales, than to settle for one that only earns through PPC, for example. A diverse income stream is ideal but if the business you are looking to buy doesn’t check this box, it may still be worth your while. As long as there are growth opportunities, as mentioned above, there will be avenues available for diversifying your sources of income. Purchasing a business is not just about money and assets, it is also about examining intangible things like growth potential and prospects for the future. Ideally you will want a business that has all these elements perfectly aligned and ready to roll, but don’t walk away from an opportunity just because you have to put a little effort when it comes to building out a team or diving into new marketing strategies. Considering this will be your business going forward, find one that will allow you to hit the ground running so you have the time and space you need to fine tune certain aspects to meet your vision. Brandon has been building, buying and selling websites for the last 8 years and brings valuable experience and insight to the table. He's very passionate about helping others successfully buy and sell web based businesses.